Garth Myers is an associate in the Litigation Group. His practice focuses on civil litigation, primarily in the area of class proceedings. Counsel to current and former inmates of correctional facilities against the Province of Ontario for damages arising from staffing-related lockdowns. Garth has discussed class actions in The Toronto Star, The Globe and Mail, APTN, Canadian Lawyer Magazine, The Winnipeg Free Press and on the CBC. While completing his J.D. from Queen’s University, Garth won an award for highest standing in the Advanced Torts course and graduated on the Dean’s List. In addition, he was an active volunteer with Big Brothers Big Sisters Canada and with Pro Bono Students Canada, and participated in an exchange program to the Rijksuniversiteit Groningen with a concentration in international law. 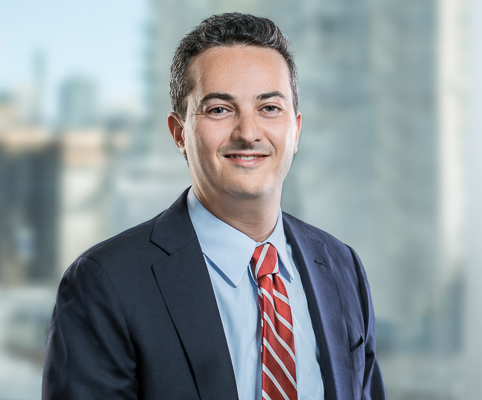 Garth completed his articles and worked as a summer student at Koskie Minsky before joining the Litigation Group as an associate. Counsel to investors in some of Canada’s largest securities class proceedings, including actions against Sino-Forest Corporation, Valeant International Pharmaceuticals, Inc., and Kinross Gold Corporation. Counsel to LGBTQ+ members of the Canadian Armed Forces, the RCMP and the Federal public service who were dismissed because of their sexual orientation in a $145 million settlement, the largest settlement for LGBTQ+ discrimination ever. Counsel to Indigenous peoples across the country against Canada for the so-called Sixties Scoop in an $800 million settlement. Biomet and Stryker hip implants class actions. Institutional abuse class actions, including Huronia Regional Centre and other Schedule 1 facilities. Garth Myers and Jonathan Ptak, "Class actions provide access to justice for historical sexual assault and abuse", The Toronto Star, December 18, 2017. Garth Myers and David Rosenfeld, “Twenty Years Later: What Are the Risks Faced by Plaintiffs’ Counsel, and How Have These Risks Changed?”, The Canadian Class Action Review, Vol. 10 (2015). Garth Myers and Celeste Poltak, “Practical and Strategic Advice Concerning Limitation Periods for Plaintiff’s Counsel”, Pleadings Tips and Traps, Toronto Lawyers Association Conference (February 2014). Garth Myers and Jonathan Bida, “Reconciling Limitation Period Principles with the Purposes and Complexity of Ontario Class Proceedings”, The Canadian Class Action Review, Vol. 8 (2013). Garth Myers and Celeste Poltak, “Update on the Evidentiary Burden at Certification”: 2012 OBA Class Action Colloquium (December, 2012). Garth Myers and Jonathan Bida, “Limitation Period Issues in Ontario Class Proceedings”. Toronto, Ont. : 2011 OBA Class Action Colloquium (December, 2011).